Of all the practices I know, the practice of Tonglen, which in Tibetan means “giving and receiving,” is one of the most useful and powerful. When you feel yourself locked in upon yourself, Tonglen opens you to the truth of the suffering of others; when your heart is blocked, it destroys those forces that are obstructing it; and when you feel estranged from the person who is in pain before you, or bitter or despairing, it helps you to find within yourself and then to reveal the loving, expansive radiance of your own true nature. No other practice I know is as effective in destroying the self-grasping, self-cherishing, and self-absorption of the ego, which is the root of all our suffering and the root of all hard-heartedness. Upon the publication of The Tibetan Book of Living and Dying, now twenty years ago, the introduction and explanation to the western world of the Buddhist practice of Tonglen for training the mind in compassion, had a tremendous and lasting impact on many readers. 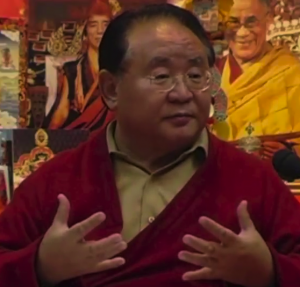 In this teaching, Sogyal Rinpoche discusses some of the key points of the practice, as well as it’s deeper significance. To learn how to do the practice itself, please see Chapter 12 of The Tibetan Book of Living and Dying. For more teachings by Sogyal Rinpoche on compassion, see the Teachings page of SogyaRinpoche.org, or the videos page on The Tibetan Blog of Living and Dying. And for those fortunate to be in Europe, Patrick Gaffney, one of Sogyal Rinpoche’s senior-most students and editor of The Tibetan Book of Living and Dying, will be giving talks in Paris and Valencia, Spain in the upcoming weeks. For more information, see here.